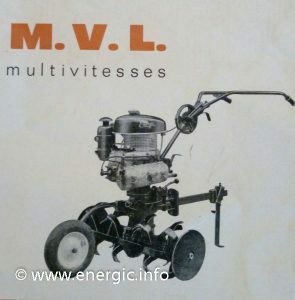 Energic Motobineuse Type 100 MVL (mulitivitesse)– For hoeing/binage 22 to 100cm. Engine/Moteur. ILO Single cylinder 148cm3, 6 cv @ 4500 rpm, 2 stroke/ 2 temp. 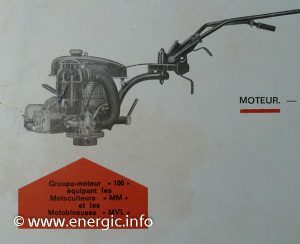 (See also Energic Motobineuse Type 100 MVL 4.3cv here). Gears. Multi speed/vitesse. 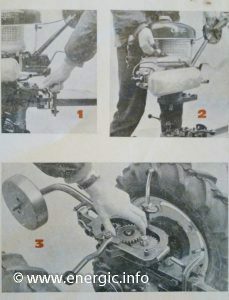 It is possible to obtain 2 speeds by adding a sprocket gear. A version “100 MVL 3” was available with the addition of 7 extra positions , altered by hand movement of a gearing sprocket solution, giving up to 14 gears! The three photos show the process to achieve the 16 different speeds/gear selection. Transformed. 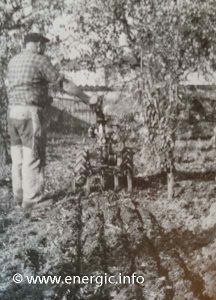 The MM can be transformed into a Tondeuse, moteur for towing a trailer (remorque), Sprayer. 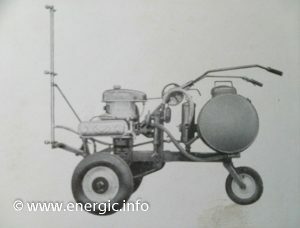 Energic Type 100 MVL transformed into a towing moteur. The trailer is in metal, and can be operated on a reasonable flat surface. Trailer dimensions 1.20 m long x .80 m wide x .40 m depth. Capable of a max. towing load of 150 kgs above the trailer weight. 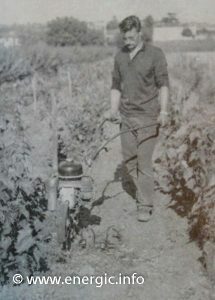 Energic Type 100 MVL transformed to a sprayer. 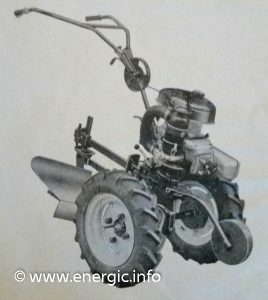 Energic Type 100 MVL transformed to a lawn mower or tondeuse. Adaptions. 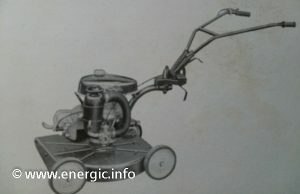 Many adaptions such as hoeing/binage 22 to 100cm, /buttoir for /buttage 13 to 36cm etc.